Nokia swears up and down that it’s not returning to smartphones, but don’t tell that to CNMO. 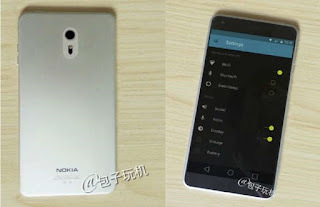 It claims to have leaked images of the C1, Nokia’s first-ever Android smartphone and its first phone of any kind since Microsoft bought its original phone business. From all indications, it’s a tiny version of the N1 tablet’s design — this is the same minimalist look, just translated to a 5-inch, 1080p display. Accordingly, you’d find budget-class hardware under the hood. The C1 supposedly packs an Atom chip and 2GB of RAM, and its only standout feature so far is its use of Android 6.0 Marshmallow. As it stands, you’ll have to wait a while to try this device (if it’s indeed real). Nokia’s agreement with Microsoft prevents it from competing in the phone space until 2016, so this is more of a sneak peek at the company’s future than a preview of an imminent product.